Garou has warred with Garou since the dawn of time. Breed has slaughtered breed, tribe has slaughtered tribe, all in the name of power or the right to be Gaia's chosen one. The Garou have a common enemy, though - the Wyrm - and dissension has made it strong. Now werewolves must unite or they will all be destroyed, and the world will soon follow. 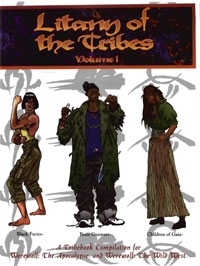 The War of Apocalypse is rejoined as the tribes are finally brought together in Litany of the Tribes Volume 1. This book unites the first three, previously out-of-print Tribebooks Black Furies, Bone Gnawers and Children of Gaia. Here is your chance to take the war to the Wyrm - in the name of breed, tribe and Gaia. Additional rules, Merits and Flaws, Rites and fetishes.